David Hockney was born on July 9, 1937 in Bradford, Yorkshire, England. Hockney studied at Bradford School of Art between the ages of 16 and 20 (1953-57). Although the common expectation at the time was that students would become commercial sign writers rather than 'fine artists' who painted and drew picture to make a living there was a small class of painters. Hockney is recognised internationally as an artist of importance, his work contributing to the history of art and continuing to inspire artists and be enjoyed by audiences throughout the world. He is commonly referred to as the 'world's greatest living painter' and the 'nation's favourite'. Must see art locations in Bradford for Hockney enthusiasts include Cartwright Hall and Salts Mill in Saltaire UNESCO World Heritage Site. 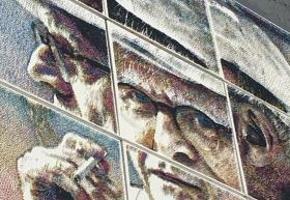 Top Tip Don't miss the giant portrait of David Hockney, made up of 250,000 nails by Marcus Levine in Little Germany, Bradford. Visit Cartwright Hall where David Hockney found inspiration as a child. Hockney visited Cartwright Hall in Bradford in the 1940s and 50s. 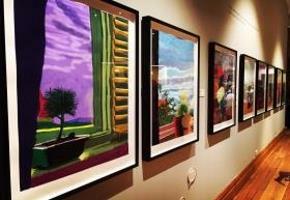 The Hockney Gallery at Cartwright Hall focuses on his life and work. The permanent gallery contains works spanning his career, and previously unseen photos from his personal albums. Get an introduction to the artist and his techniques, see early works showing how it all began in Bradford with Hockney learning to draw and watch a film specially edited for Bradford Museums & Galleries showing newly released footage of the artist. Follow in Hockney's footsteps to Cartwright Hall, and see the large iconic pool scene ‘Le Plongeur'. Saltaire has some of Britain's finest Victorian buildings, and Salts Mill is home to one of the largest collections of David Hockney’s art. On the ground floor you will find the 1853 Gallery which houses a permanent exhibition of works by David Hockney. Gallery 2: David Hockney's Birthday Show: On show is a selection of David's work for and around the opera, plus exquisite etchings and lithographs from the 1970s and 80s. 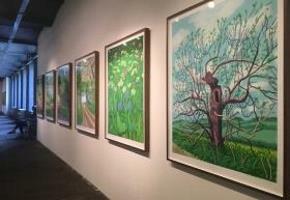 See 'The Arrival of Spring' by David Hockney, 3rd Floor Gallery. This set of original works were drawn by David on his iPad in 2011, and printed at an incredible scale. Visiting UNESCO World Heritage Site, Saltaire take a stroll around the historic village. There’s no better place to celebrate Hockney than the city where he grew up and was inspired to become an artist. We'd love to hear about your visit, so please say 'hello' on Twitter @VisitBradford, Instagram or Facebook/VisitBradford ... or pop in and see us at one of the Visitor Information Centres.